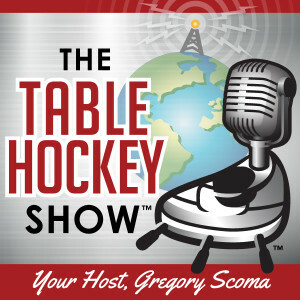 Reggie Stefaniszyn - Viking, AL; Europe & NHL's Sutter Bros. · The World Table Hockey Association, Inc.
Home / Area News / Reggie Stefaniszyn – Viking, AL; Europe & NHL’s Sutter Bros.
On this show we talk one-on-one with world traveler and table hockey diplomat, Reggie Stefaniszyn. Reggie is from Viking, Alberta, Canada. We talk about table hockey in Europe, Canada and in particular his hometown of Edmonton. During our show, Reggie talks about playing ice hockey with and against some of the National Hockey League’s (NHL) famous Sutter brothers. The Sutter family, originally from Viking, Alberta, Canada, are one of the most famous families in the National Hockey League (NHL). Six brothers: Brent, Brian, Darryl, Duane, Rich and Ron, reached the NHL in the 1970s and 80s. Four brothers, Brian, Duane, Darryl and Brent, have gone on to become coaches and general managers as well. All brothers played either for the Chicago Blackhawks or the St. Louis Blues at one point or another. Maxim Borisov for winning the International Table Hockey Federation’s (ITHF) 2013-2014 season tour of tournaments. He played in five tournaments and won four of them. Jun 2014. Reggie Stefaniszyn for winning the Canadian Nationals tournament, Montreal, Canada. In 2nd place was Eric Desjardins (Canada) and in 3rd place Kent Richter. ITHF world tour. June 2014. Reggie Stefaniszyn for winning the US Open, Chicago, Illinois. In 2nd place was Eric Davis (USA) and in 3rd place Jerry Wikstrom (Sweden). ITHF world tour. July 2014.